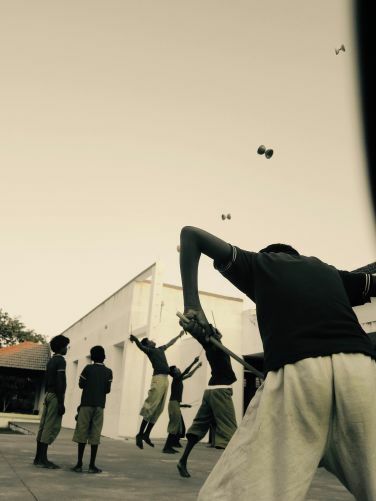 After a one month workshop of circus techniques at the Kattaikkuttu Gurukulam, the children had the chance to reflect about pollution and environment. Using their circus and theatre skills, the show ’WATER’ was performed for their families, teachers and friends in november 2016. We are very proud and thankful with all Kattaikkuttu students and staff. THEY ARE AMAZING!!!!! We are so happy to anounce that we have reached our crowdfunding goal!! Thanks to all our friends, family, classmates, collegues and anonymous supporters from all around the world. You all made this possible. Special thanks to all the family Kattaikkuttu Sangam for opening your hearts. Staff, teachers, students and volunteers, you are the best! Now we are excited to continue our journey with the show PLASTIKKATTI at the Ranga Shankara Theatre in Bangalore on the 17th and Chennai on the 19th november. It s really seems that PLASTIKKATTI Show will have a little tour in South of India! After the performance in Kolivakkam Village and at Kattaikkuttu Sangam, we will perform in tree other places! 19th November: International School of Chennai! We are so exited for the success of our show, and always really happy to share it with people! We presented our show PLASTIKKATTI at the Kattaikkuttu Sangam! The students were so happy to see their teachers performing and they overwhelmed us with a lot of love! Now we are working with them to prepare their collective presentation using plastic and recycled materials! UATAUEISTt made friends with a nearby village and previewed the show PLASTIKKATTI for KOLIVAKKAM. This was a sensational experience for all who participated, us included! We had the chance to share with our art something we believe in to an incredibly receptive and attentive audience. 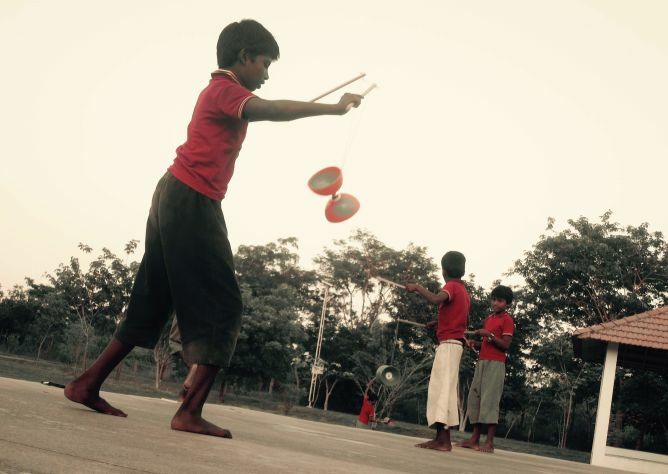 UATAUEIST Project arrived in India on the 2nd October 2016 and started circus workshops at the Kattaikkuttu Sangam in Tamil Nadu. Here you can have a taste of our work and what is going on at the school while we are here…kids are learning really fast!!! Support our crowdfunding project and help us to continue!! Today at the Kattaikkuttu Sangam school we celebrated the birthday of Saraswati, goddess of knowledge, wisdom and arts. Tradition in India says that today is a good opportunity to learn something new and bless your most precious belongings. 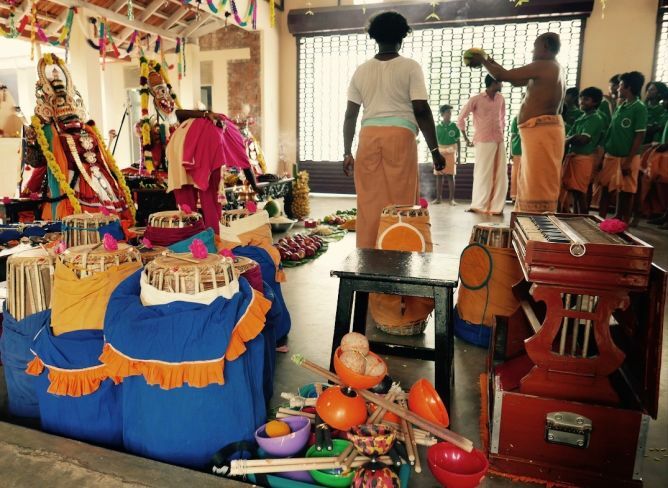 The altar was full of Kuttu costumes, music instruments, notebooks and for the first time…diabolos!! We are very thankful with all the supporters of our project in Wemakeit. 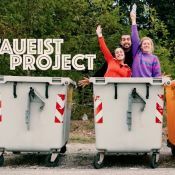 We also offered UATAUEIST Project to be blessed by Saraswati hoping to reach our crowdfunding goal!! Tell your friends and keep supporting us!